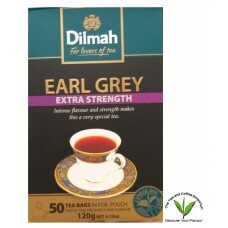 Description- An aromatic floral note yields the citrus flavour of original Earl Grey. A strong Ceylon Tea is the base of this elegant and refined experience. The slightly earthy character of this tea is beautifully balanced by the sweet, floral bergamot flavour. Ingredients- Ceylon Black Tea, and Bergamot flavour. What We Think- Dilmah’s real strength lies in the quality of their black tea’s. The Ceylon tea’s they produce are all single origin and of the very highest quality. Black tea’s are best steeped for between 2-4 minutes with boiling water.